Last Sunday I picked up my first (of two) joeys. I get the other one this coming weekend. Due to living in Korea I am very limited to ordering and importing some glider food like glider chow. I researched the glider diet but when getting my girl from the shop owner he told me just to feed her yogurt, apples, and some nector pod treats. It seems so unbalanced to me though. I tried bananas but she didn’t seem to take to them. Today i tried mixing apples eith eggs and carrots but she seemed super against that too. Right now she is only taking to the apples, yogurt and nector pods. She also doesnt seem to be drinking too much water so I am really worried. She seems to have boneded to me some but so far i dont see her playing at all. Is it because she is still adjusting? When i hold her she doesnt crab too mush anymore but likes to ball up into a ball or when i pet her she goes quiet and speads all limba out. Is that normal? Anyone have any suggestions on how to get her to eat more foods while still eating? I am scared ahe isnt eating or drinking enough. 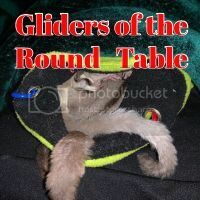 Hi, and welcome to Glider Central! Mine prefer a silo or dish. They even clean their face and washout their mouth in it. I'm not sure what glider Staples are available in Korea, I know postage can get expensive. You may be able to use the BML diet. I use a bottle. I will try the dish and see if that changes anything. In korea there seems to be no dry food available except one from japan and I would buy and pay the expensive shipping but i am just worried it wouldnt get through customes. I will check out the BML diet.